Hot lead is better than cold steel. Learn to sling it effectively. Cameo appearance by Tech Sights. This entry was posted in rifle, rkba, training and tagged 7.62x39, SKS. Bookmark the permalink. 15 Responses to Hot lead is better than cold steel. Do not be so quick to dismiss cold steel. I’ve never heard of a bayonet running out of ammo. And a weapon so highly regarded by Napoleon Bonaparte and Stonewall Jackson should be respected. A silent bayonet charge at the Battle of Yorktown, Virginia was the tactic used to successfully take the British ramparts by surprise. The Brits had a successful bayonet charge in Iraq in 2003, but that’s scarce these days. A bayonet is useful for prodding stuff in MOUT and stopping someone from trying to grab the muzzle. Hi, this is the model. I would have thought Appleseed would have thought this was funny, because the Redcoats’ main attack was bayonets, whereas the colonists practiced marksmanship a lot more. Also Isaac Davis made bayonets for his troops. That’s funny, right there: The shooter needs to tighten that sling up. Hanging loose like that, it’s not doing a darn thing. The sling is set up for hasty-hasty, but she is slung up in hasty. I have worked with Emily enough that I know she understands the difference. She also doesn’t typically shoot from kneeling; she uses a loop sling in the seated position. I’m guessing it was done this way for the photo shoot, to save some time. Sometimes you do what you have to do for the situation. An aluminum bayonet on the end of an SKS is not terribly useful. 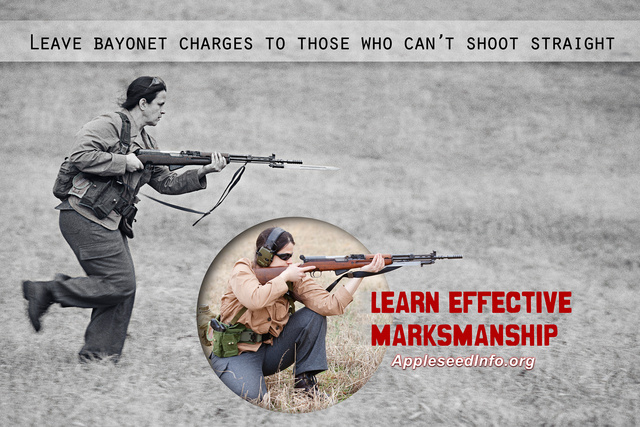 Remember though, Bayonets, like Machete have one useful feature compared to a firearm. They do not click on Empty! Knives and Cold Steel do not run out of “ammunition”…the person holding them will. I recall a video from, China, I think it was, a fella grabbed another fella from behind, started stabbing him. Got to about 30 before he looked to be out of “ammunition”. Barky spoke of the obsolescence of horses and bayonets, whereas you would think he would be in favor of them. A horse with a bayonet mounted becomes a unicorn, whose farts are needed to provide us energy once he’s shut down all the other sources. I have seen SKS with trefoil bayonets and I have seen SKS with blade bayonets, I have never seen an SKS with an aluminum bayonet! Do not let the silver (chrome??) plating fool you. I read of a guy in the second Iraq war, I think he was a Spaniard, who ran out of ammunition, so he pulled a big knife and charged across an intersection at the Iraqi\’s who were shooting at him, and they all ran away. While it is better to keep your distance and kill via superior marksmanship, the sight of a man charging at you with naked steel has an impact that is out of proportion to its real risk – because there is no doubt that the guy is going to try to stick you with it. People have been afraid of spears for linger than they have been afraid of guns – the immediacy of the prospect of being skewered leads even courageous men to evaluate the value of their own skin. Given a choice, I would prefer to stay behind in a supporting sniper role, rather than charging to get up close and personal. I’ve always been curious as to whether those tech-sights really hold up to repeated recoil.